In December 2016, a salvage excavation was conducted at Modiʻin’s cemetery (Permit No. 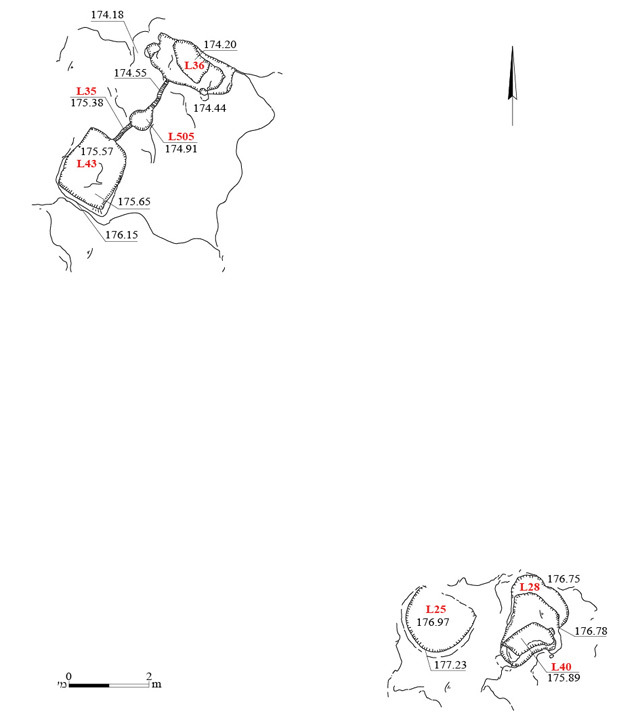 A-7862; map ref. 197433–803/648395–882), prior to the cemetery’s enlargement. 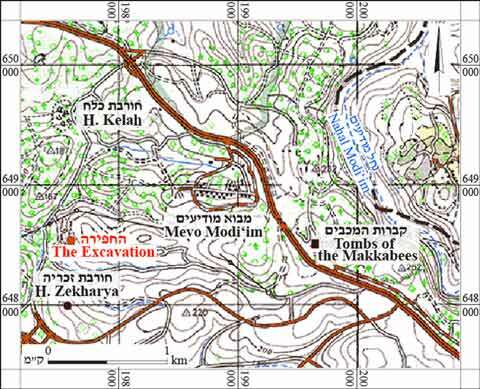 The excavation, undertaken on behalf of the Israel Antiquities Authority and financed by the Modiʻin Economic Corporation, was directed by E. Oren, with the assistance of E. Bachar and Y. Amrani (administration), M. Marmelstein (area supervision), M. Kahan (surveying and drafting), L. Brailovsky (flint tools), A. ‘Asav and I. Korenfeld. 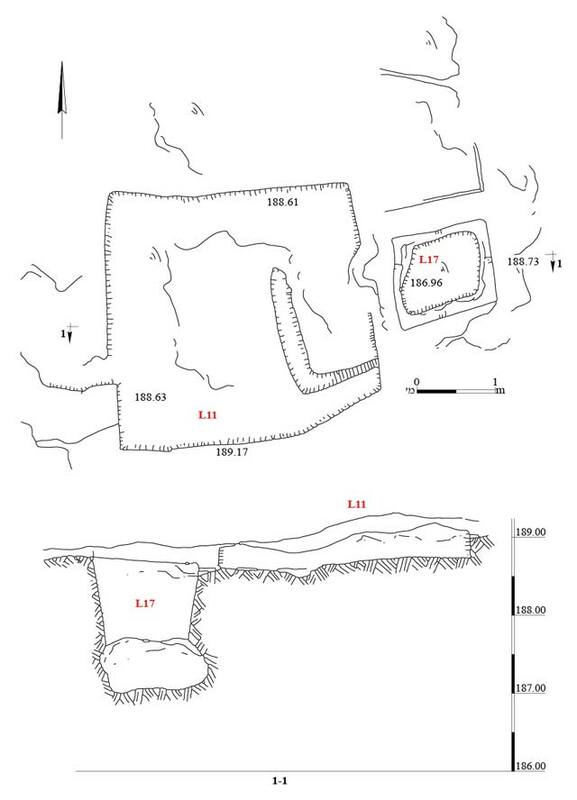 The excavation area was located at Horbat Kelah (Haiman 2013), near Horbat Zekharya (Shachar 2017), where agricultural installations dating from the Hellenistic to the Byzantine periods were found. 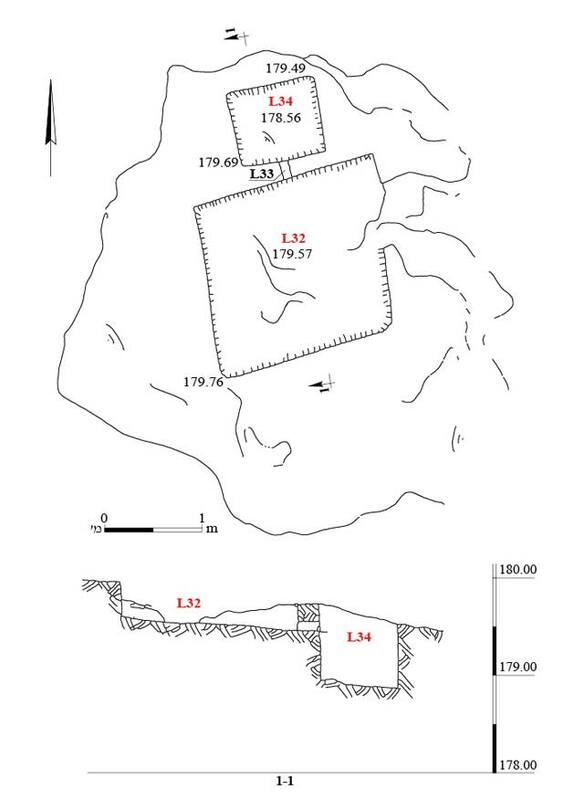 Numerous cupmarks and flint artifacts from the Pre-Pottery Neolithic A period (Spivak 2012) were also recovered in this area. The excavated rock-hewn agricultural installations include agricultural terraces, winepresses, basins, channels, cupmarks and cisterns that were planned so as to exploit the slope to store runoff water. Winepresses. Three winepresses were unearthed. One of the winepresses had an east-sloping treading floor (L11; height of preserved walls 0.45 m; Figs. 2, 3), from which the must flowed via a hewn channel (length 0.2 m, depth 6 cm) to a collecting vat (L17) that still had traces of plaster on its walls. Several of the walls and the floor of the winepress were cut into in a later phase (Fig. 4). 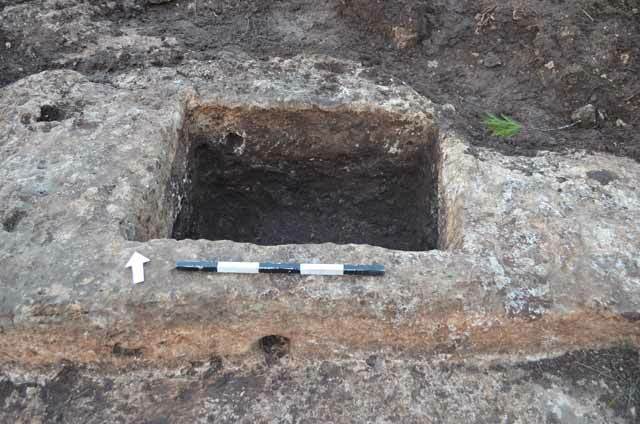 The floor of the collecting vat was also cut into, and it was slightly enlarged, possibly for use as a cistern once the winepress was no longer in use. Several small cupmarks (average diam. 6 cm) were recorded around the winepress; they may have served to anchor posts that carried its roofing. The second winepress had a northeast-sloping treading floor (L20; height of preserved walls 0.87 m; Figs. 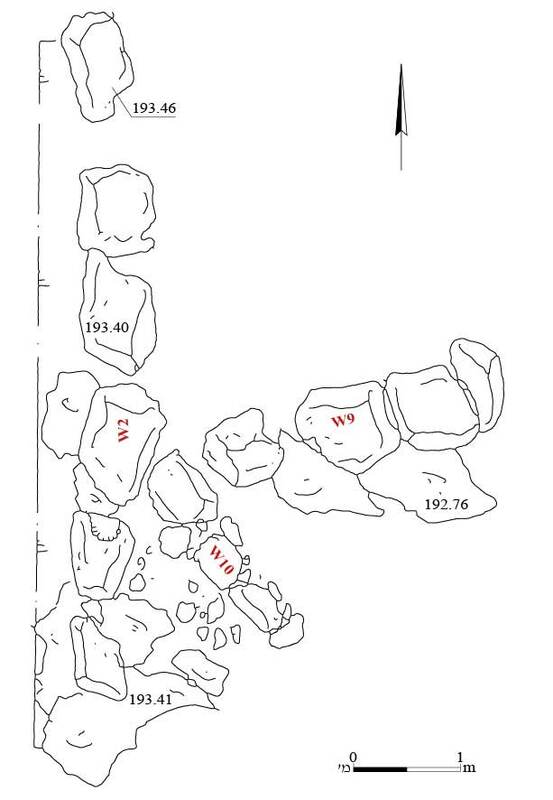 5, 6), from which the must flowed via a hewn channel (width 0.15 m) to a collecting vat (L21) with a small settling pit in its northwest corner (L23). 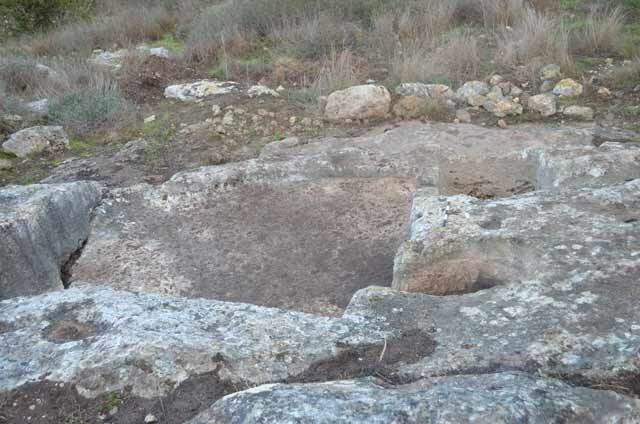 Near the treading floor’s southeast corner was a circular pit (L22), which was not connected to the treading floor or the collecting vat, and therefore was probably used to store grapes before treading them. Small cupmarks (diam. 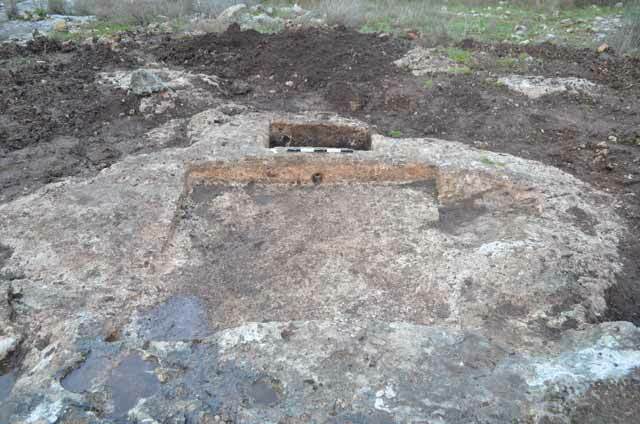 5–8 cm) were identified around this winepress as well. The third winepress had a north-sloping treading floor (L32; Figs. 7, 8), from which the must flowed via a through-hole (L33; Fig. 9) to a collecting vat (L34). The east wall of the winepress was not preserved. Cisterns, basins and water installations. A water cistern was uncovered (L27; diam. 1.2 m, depth 1.4 m; Fig. 10). A shallow gutter hewn in its south wall carried the water into the cistern. At some stage, a shaft (diam. 0.8 m, depth 1.2 m) was cut into the floor of the cistern, widening out into a cavity; the cavity was not excavated. The floor of the cistern was apparently quarried into at some time to form a bell-shaped chamber. A small amount of white plaster was found on the walls of the cistern. 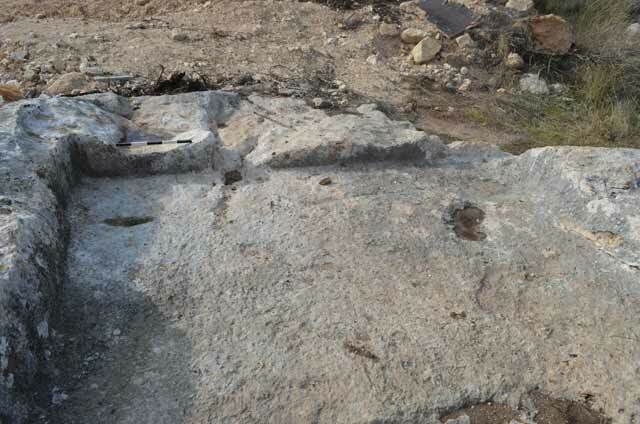 A rock-hewn basin (L24; depth 0.85 m) was located near the cistern’s west side. It was probably used to filter out water-borne debris, such as small stones, branches and soil. Another cistern, revealed west of the basin, comprised a narrow shaft (L26; diam. 0.8 m, depth 2.2 m) opening out into another cavity. The cavity was not excavated for safety reasons, but it is probably a bell-shaped cistern. Shallow rock cuttings (depth 0.05–0.17 m) found near the cistern may have been used for filtration. A reservoir (L36; max. depth 1 m; Fig. 11) fed by water from two rock-hewn basins was unearthed. An upper basin (L43) collected the runoff water, which ran via a channel cut in the rock (L35) to a smaller basin (L505) that probably filtered it before it flowed through a second channel into the reservoir. An irregularly shaped pit (L28; depth 0.8 m) to the southeast of the pool was largely natural, with a rock-hewn west wall. An elliptical shaft on the west side of the cistern was blocked with stones; the pit may have been used for storage or as part of a hiding complex. A basin (L25) hewn to the west of the pit was probably used for filtration. Field walls. Four walls built on bedrock were excavated in the west of the excavation area. An east–west wall (W3; length c. 16 m, width 0.12–0.30 m; Fig. 12) built of fieldstones, both small (average size 0.20 × 0.25 m) and large (average size 0.7 × 0.8 m), was preserved to the height of one course. A north–south wall (W2; length 7.2 m, width 0.5–0.7 m; Fig. 13) was built of large fieldstones (average size 0.6 × 0.9 m). 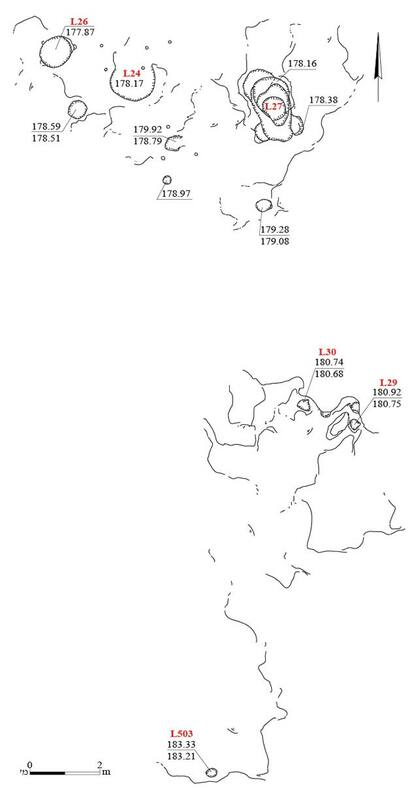 Wall 2 was abutted by two walls from the east (W9—length 3.1 m, average stone size 0.7 × 0.7 m; W10—length 1.5 m, average stone size 0.4 × 0.4 m). The walls’ function is unclear; they may have been part of a cattle enclosure. Cupmarks. Numerous cupmarks of various sizes and depths were documented (e.g., Figs. 10:29, 30, 503; 14:6, 507). 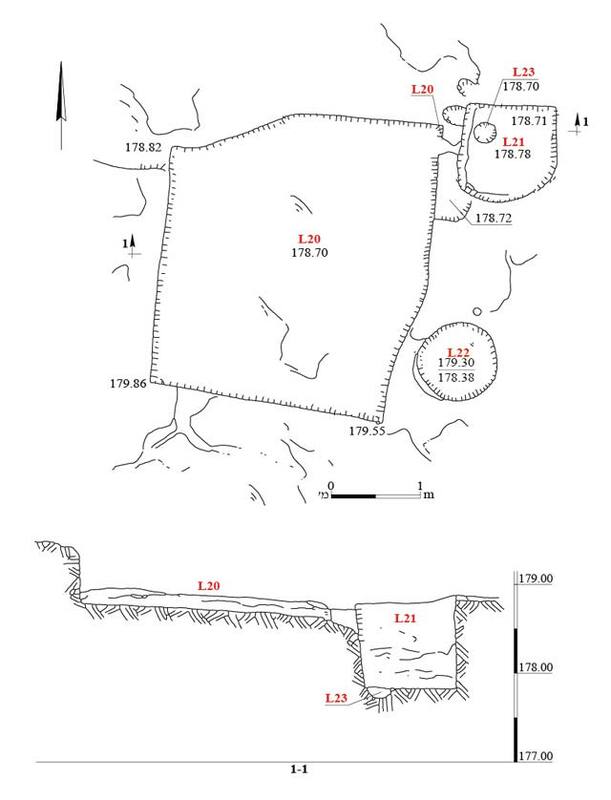 Such cupmarks are variously interpreted by scholars as having been used for rainwater storage, cereal crushing, olive-oil production and quarrying out flint for tool knapping. Larger groups of cupmarks were found near agricultural installations, suggesting that they were linked in some way. A few nondiagnostic potsherds were recovered from the excavation area. Flint finds. The small assemblage of flint surface finds consisted of primary flakes. Most of the flints have no datable characteristics. An exception to this is a bifacial tool—a chisel bearing signs of transversal flaking. Tools of this type are characteristic of the Pre-Pottery Neolithic A and the early Pre-Pottery Neolithic B periods. These remains do not seem to indicate the existence of an ancient settlement in the area, as the assemblage consists mostly of knapping debris, some of which was swept there. 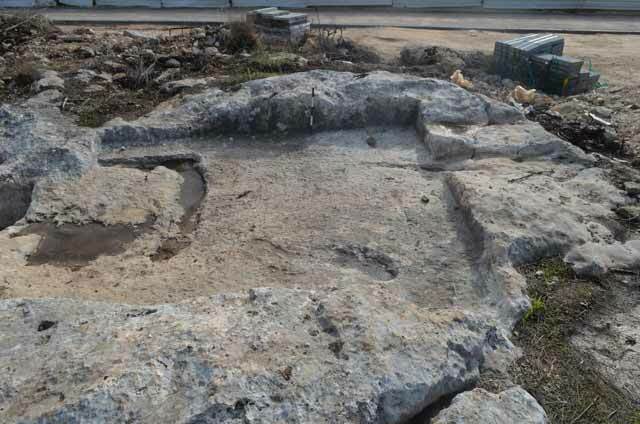 The excavation finds resemble those from earlier excavations in the region, and they are probably associated with farmers from the two adjacent settlements: Horbat Kelah and Horbat Zekharya. The paucity of pottery recovered from the site makes it difficult to date the installations, but they are typically dated to the Roman and Byzantine periods. The ancient local population knew how to exploit runoff water from the hill slopes, channeling and storing it in cisterns and reservoirs for use in agriculture and for domestic consumption. Haiman M. 2013. Horbat Kelah (East). HA-ESI 125. Shachar D. 2017. Horbat Zekharya. HA-ESI 129. Spivak P. 2012. Horbat Kelah (A). HA-ESI 124. 2. Winepress 11, plan and section. 3. Winepress 11, looking south. 4. Rock-cuttings in the treading floor, looking north. 5. Winepress 20, plan and section. 6. Winepress 20, looking east. 7. Winepress 32, plan and section. 8. Winepress 32, looking north. 9. Through-hole and collecting vat, looking north. 10. 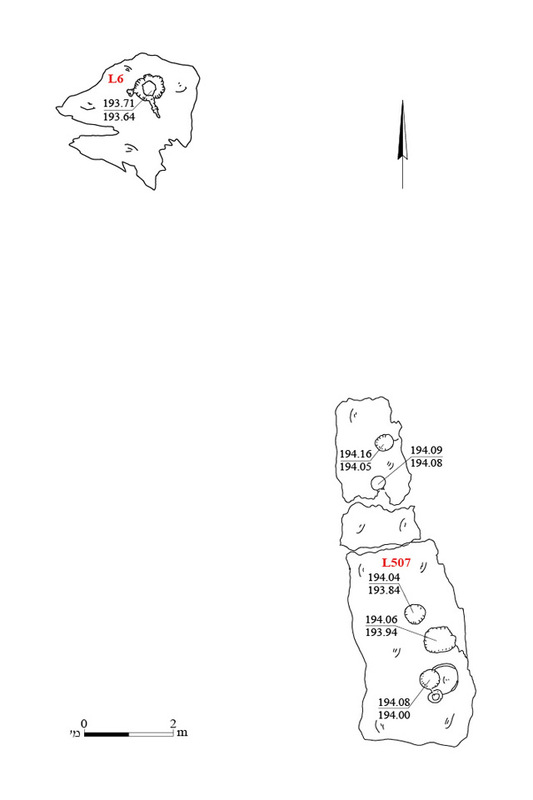 Cistern 27, Basin 24, Shaft 26 and cupmarks (29, 30, 503, 504), plan. 11. Pool 36 and Cistern 28, plan. 13. Walls 2, 9 and 10, plan. 14. Cupmarks 6 and 507, plan.